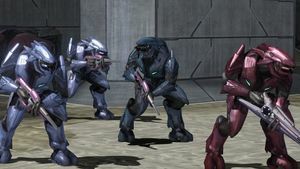 This article is about the collection of Sangheili-led groups before the Covenant's destruction. For the collection of new factions after the Covenant's destruction, see Covenant remnants. The Covenant separatists; all Sangheili (along with many loyal Unggoy, Mgalekgolo, and other species) cast out from the Covenant empire seeking revenge. Covenant separatists were the various forces who broke away from the Covenant during the Great Schism, composed of all the ejected Sangheili, as well as others who allied with them. When the Great Schism broke out on November 3, 2552, the entirety of the Sangheili species were forced out of the Covenant. The High Prophet of Truth had ordered the Covenant military, now led by the Jiralhanae, to massacre the Sangheili. This caused a massive civil war to erupt across Covenant-controlled space. Though only the Sangheili were forced out, many of their former allies sided with them instead of siding with the High Prophet and Jiralhanae-led Covenant. Many Unggoy, Mgalekgolo and even one San 'Shyuum named Zo Resken, joined the separatist effort. Many Sangheili-led groups sought to destroy the Covenant led by the High Prophet of Truth and Jiralhanae, although only the Fleet of Retribution would extend their allegiance to the UNSC. Sangheili-controlled and Jiralhanae-controlled ships engage each other over High Charity. The Covenant separatists were formed as a result of the Great Schism. The High Prophet of Regret led a badly planned mission to Earth, against the wishes of the High Prophet of Truth, and inadvertently began the Battle of Earth, as he did not know that the planet was the human homeworld. He escaped to Installation 05, where he was assassinated by John-117. Using Regret's death as a justification, the High Prophet of Truth set in action his plan to replace the Sangheili with Jiralhanae as their protectors. However, this move resulted in great turmoil within the Covenant, with the Sangheili threatening to resign from the High Council. Truth then gave command of the Covenant fleets to the Jiralhanae, a post previously held by the Sangheili. Once there were enough of them in place, Truth secretly ordered them to commit a vicious genocide of the Sangheili (disguised as a retaliation to a Sangheili revolt against the other Covenant factions) so they may replace them in society. Soon, all-out war had broken out. In response to the betrayal, the Sangheili formed an organization colloquially known as the Covenant separatists, supported by both many Unggoy and Mgalekgolo. During the early hours of the conflict, the movement lacked leadership, but several leaders would soon emerge. The Arbiter Thel 'Vadam rescued several of the few surviving Sangheili High Councilors from Jiralhanae captivity and met up with Shipmaster Rtas 'Vadumee on Installation 05, forming the Fleet of Retribution. Concurrently, Imperial Admiral Xytan 'Jar Wattinree took command of a large fleet of surviving Sangheili ships, including most of the Combined Fleet of Righteous Purpose. An initial Sangheili-led separatist group was formed by the Sangheili Imperial Admiral Xytan 'Jar Wattinree on the Sangheili fortress world Joyous Exultation shortly after the Prophets' betrayal on November 3, 2552. Wattinree's faction remained hostile to humanity as well, dispatching a task force to Onyx to prevent Forerunner technology from falling into human hands. However, this fledgling alliance came to an abrupt end with the detonation of a NOVA bomb above Joyous Exultation and the deaths of the majority of the Sangheili leaders gathered there, including Wattinree. This left Thel 'Vadam and Rtas 'Vadum as the remaining figureheads of the rebellion. Though not easily persuaded, the Arbiter was able to convince the rest of the Sangheili to join with Humanity. While the two factions experienced some initial friction, they learned to work with one another for mutual survival. Within the Covenant separatists, only the Fleet of Retribution allied with humanity during the final battles of the war. The Fleet of Retribution, the bulk of the separatist war effort. The shaky-to-steady alliance between the Fleet of Retribution and their former foes, the Humans, was forged entirely out of necessity and revenge against the Covenant. The UNSC forces were on the defensive, and both factions had two common enemies that wished for their extinction: the Covenant and the Flood. The alliance of circumstance began in the control room of Delta Halo, when UNSC Sergeant Major A. J. Johnson and 'Vadam were forced to unite in order to prevent Tartarus, Chieftain of the Jiralhanae, from activating Installation 05. After that, 'Vadam persuaded the rest of the Sangheili on the Installation to join humanity. While the two factions experienced some friction, they learned to work with one another for their mutual survival. During the final days of the Human-Covenant War, the Sangheili under 'Vadam and 'Vadum's command fought alongside humans in battle. Thus, the UNSC and Sangheili forces saved each other from destruction. Humans and Sangheili onboard the Shadow of Intent's bridge. The devastated UNSC Home Fleet in Earth's space gladly accepted the help of the superior Fleet of Retribution warships. The Sangheili understanding of Covenant combat equipment and tactics proved invaluable in the Battle of Installation 00. The battle's recurring heroes, Thel 'Vadam and John-117, fought alongside one another many times in the desperate and long conflict. After various separatist groups were victorious in destroying the Covenant that had betrayed them, many Sangheili split off into several remnant factions. The Sangheili who were in the Fleet of Retribution would later form a faction known as the Swords of Sanghelios, which would become the official government of Sanghelios. This Sangheili-led faction broke away from the Covenant prior to the Great Schism after learning that the Great Journey was a lie. Monitor Guilty Spark had informed Sesa 'Refumee the true purpose of the Halo Array, resulting in 'Refumee ordering his forces to cut communications with the Covenant and break away. The faction posed a threat to the Covenant's religious stability, and was destroyed by a Covenant Special Operations unit and the new Arbiter. After the Great Schism occurred, many of the later Sangheili remnant groups such the Combined Fleet of Righteous Purpose and the Fleet of Retribution would continue the legacy of Sesa 'Refumee's faction by destroying the Covenant with many abandoning its religion. One of the leaders in this effort was Thel 'Vadam, the Arbiter responsible for the destruction of the faction. Once the Great Schism had begun, the entirety of the Sangheili species (along with several loyal Unggoy, Mgalekgolo and other species) had left the Covenant. The Covenant separatists were not one unified faction, however, many shared the same goal in their fight against the Covenant leadership that had betrayed them. This assembly of Sangheili forces was a short-lived predecessor to the more prominent assembly led by Rtas 'Vadum. At the onset of the Great Schism, Imperial Admiral Xytan 'Jar Wattinree summoned all Sangheili to the base world Joyous Exultation for an emergency meeting. 'Wattinree revealed the Prophets' treachery to his comrades and issued a fleet-wide missive of an alliance among the Sangheili to destroy both the Prophets and their Jiralhanae allies. With the exception of Voro Nar 'Mantakree's Second Fleet of Homogeneous Clarity, the entirety of this force was destroyed by a UNSC NOVA bomb during the summit. Meanwhile, the survivors were wiped out at Onyx by the Forerunner world's automated defenses. The Fleet of Retribution led by Rtas 'Vadum and Thel 'Vadum joined forces with the UNSC. Together they destroyed they destroyed the Covenant led by the High Prophet of Truth on the Ark and brought an end to the war. This fleet was led by a certain shipmaster. Once this fleet learned of the Prophets' treachery, they killed the Prophet of Conviction on board their flagship. They went on to hunt down Jiralhanae that had betrayed them. With the exception of Hesduros, which had been cut off from Covenant communications, the rest of the Sangheili received a video message displaying the Covenant's betrayal of their species. They witnessed Jiralhanae slaughtering their brethren, some considered it to be "the death of the Covenant". Either during the massacres around High Charity, or witnessing the massacre broadcasts, all Sangheili were ultimately forced out of the Covenant Empire. UNSC Pelicans fighting alongside the Fleet of Retribution Phantoms. Rtas 'Vadum, one of the leaders of the Fleet of Retribution. ↑ 2.0 2.1 2.2 Canon Fodder - "The resulting conflict would be called the Great Schism, and it would divide the Covenant into two, ultimately forcing the Sangheili out." ↑ Halo 3, campaign level The Covenant "I will have my revenge on a Prophet, not a plague!" ↑ Halo 2-The Great Journey-"There are things about Halo even the Hierarchs do not understand." ↑ Halo: Evolutions The Return (Motion Comic) - "The death of the Covenant."